Below is the list of pricing. Volume prices will show during checkout. Whether you have TQM, Quality Circles, or a home-grown suggestion system, sooner or later, your on-going program is going to need a shot-in-the-arm. That isn’t a reflection on your program. It’s just natural, due to the pressures of everyday living, for people to lose sight of activities that are familiar and on-going. Keeping people interested in long-term activities is a challenge. Unless you stimulate your on-going program with occasional short-term events, your effort will probably show a decline in employee interest. Our campaigns are designed to provide that stimulation. They work because they take a simple goal and put it in a short time frame. They use humor to arouse interest and recognition to encourage participation. Operation time is four weeks ¾ long enough to build up interest and gather valuable ideas, short enough to sustain the impact. 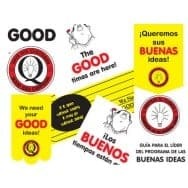 The Good Idea Campaign focuses on quality and customer satisfaction. It is a 30 day special event that encourages everyone to seek out improvement opportunities, find ways to eliminate recurring problems, and have a positive impact on customer satisfaction. This is a program your entire organization will enjoy by benefitting from positive encouragement.